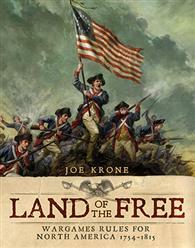 Osprey Publishing has started taking pre-orders for their new Land of the Free rulebook, which helps you recreate conflicts from around the American Revolution. Land of the Free: Wargames Rules for North American 1754 – 1815 are now available to pre-order from the Osprey Publishing website. Designed to capture the tactics and atmosphere of the battlefields of late-18th and early 19th-century North America, Land of the Free is a miniatures wargame that embraces this tumultuous time. The simple, but challenging, rules have been developed with flexibility in mind, and can accommodate both small skirmishes and large engagements. With scenarios and force lists for the French and Indian War (1754–63), the American Revolutionary War (1775–83), the Northwest Indian War (1785–95), and the War of 1812 (1812–15), Land of the Free is a dynamic, versatile game that allows gamers to recreate the battles that birthed a nation.